Instead of reviewing new music on vinyl, this time out On the Record tells you all about Rock 'N' Rolla's new UFO turntable. Yes, it's out of this world! Do you think your friends would think you're nuts when you tell them that a UFO has landed at your house? Well disbelief will turn to envy when the UFO, in fact the new highly-portable UFO turntable from Rock 'N' Rolla, comes in for a landing at their place and becomes the life of the party. The latest in Rock 'N' Rolla's line of portable turntables, the UFO takes its name from the fact that its case is rounded, and spotted from a distance it may well remind some of a craft from outer space. Most will think of the UFO as an "unlimited fun object" though, as that's the idea behind the very modern device with a retro vibe. The player has built-in speakers and the ability to play records that spin at 33, 45 and even 78-RPM, and it's very easy to transport the UFO from place to place; just tighten the "fixed screw" to secure the actual turntable, grab the handle and go. Loosen the fixed screw when you're all settled in and the platter party is ready to begin. For power, the UFO has a built-in battery that lasts for four hours and an A/C adapter/charger that'll keep discs spinning as long as you'd like. The UFO has an auxiliary input jack, an output for earphones and outputs that enable the player to be plugged in to a stereo system as you would a stationary turntable. The UFO has Bluetooth capability and the ability to record the records you play to a USB drive, and the recording feature is easy to stop and start if, for example, you want to play a whole album side but only record select songs. Playback of music on a USB drive is a breeze too and can be fully controlled with play/pause, next and back buttons. 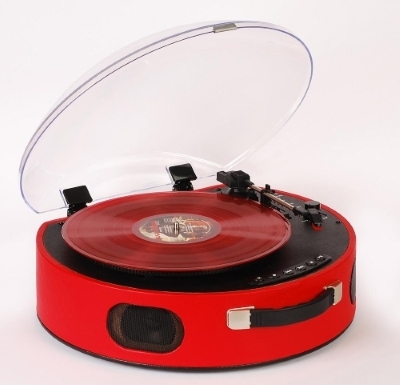 The UFO comes with a 45-RPM adapter for playing singles, has a durable case and a sturdy dustcover and is built to take the minor bumps and scuffs that may come along with moving the player from party to party. The UFO is shipped with a partial charge, so you'll be ready to rock as soon as you unpack it. Just remember, once you start showing your friends your UFO, you'll be the one responsible for starting a UFO invasion!